Could you live off the land? Kate Humble and Gareth Wyn Jones. Kate Humble and Gareth Wyn Jones with tomorrow’s dinner. Want to get away from it all? Dream of escaping the rat race? Feel like moving to the countryside to live off the land? Could your family swap the city for a hill farm set in the spectacular countryside of North Wales? BBC Wales and Folk Films are launching a UK-wide search for three families prepared to take on the challenge of living and working on a hillside farm in Snowdonia this August. Three families who think they’ve got what it takes to be full-time farmers will live side-by-side in a purpose-built yurt camp for three weeks, working together on some tasks and competing against each other on others. They will need to convince a panel of expert judges they can handle life on a modern farm. 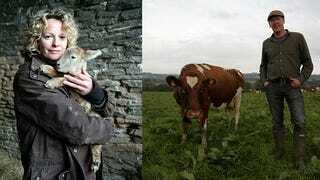 Produced by Folk Films for BBC Wales, the series will be presented by Kate Humble and Gareth Wyn Jones. No previous experience is necessary, but applicants must be willing to try their hand at all manner of agricultural assignments as they find out just how tough farming can be. It will be three weeks of early starts, late finishes, dirty jobs in all weathers and facing the reality of producing food as they kill, cook and eat their livestock - this challenge is not for the faint-hearted. To apply please email familyfarm@folkfilms.tv, phone 02920 727 801 or write to Folk Films, 17 Cathedral Road, Cardiff, CF11 9HA. See here for full terms and conditions. Contact details need to include a phone number, and the closing date is Sunday 11 June.